Rajat Kiinni! - Finnish "PEGIDA" - the first year of our EPIC struggle! Rajat Kiinni! 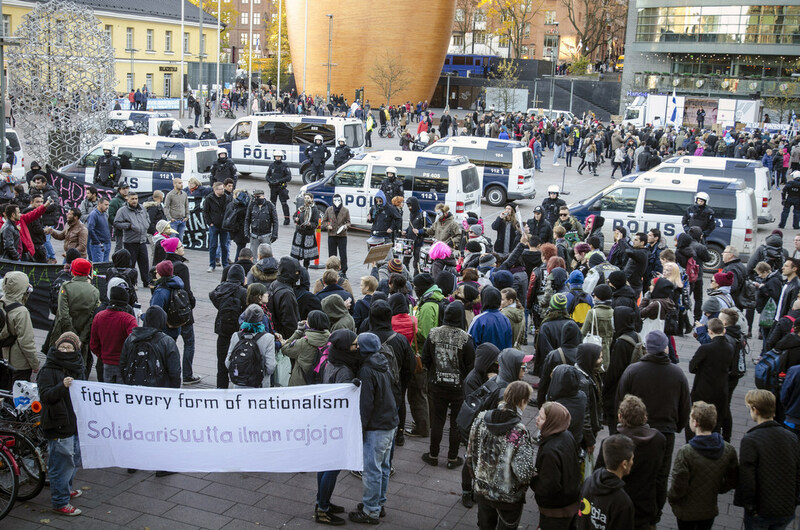 – Finnish ”PEGIDA” – the first year of our EPIC struggle! Rajat Kiinni! 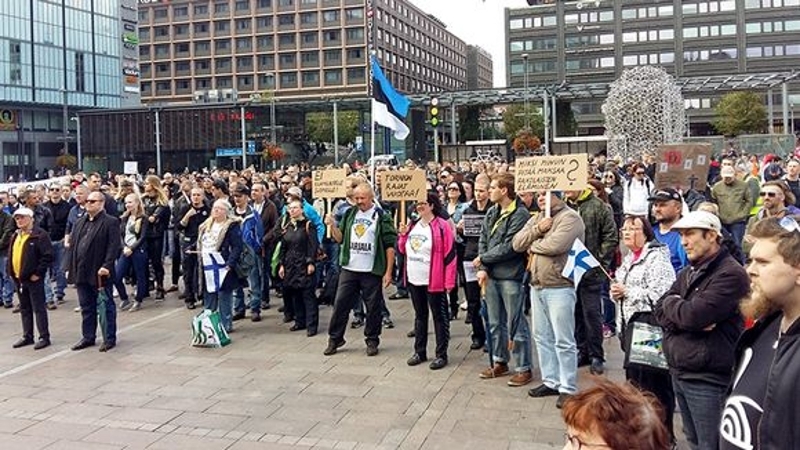 -Kansanliike (RKK) is the biggest people’s movement in Finland that opposes immigration. Its Facebook group has now around 12 500 members. The movement is now 1 year old and depending on who you ask it turned 1 year old the 30th of August, the 19th of September or the 3rd of October 2016. But it doesn’t matter. What matters is that we’ve had tons of fun! We’ve been a real pain in the beehive for the ruling classes. The elites have had little peace during the last year because of their extremely stupid migration policies and us. We’ve been there. 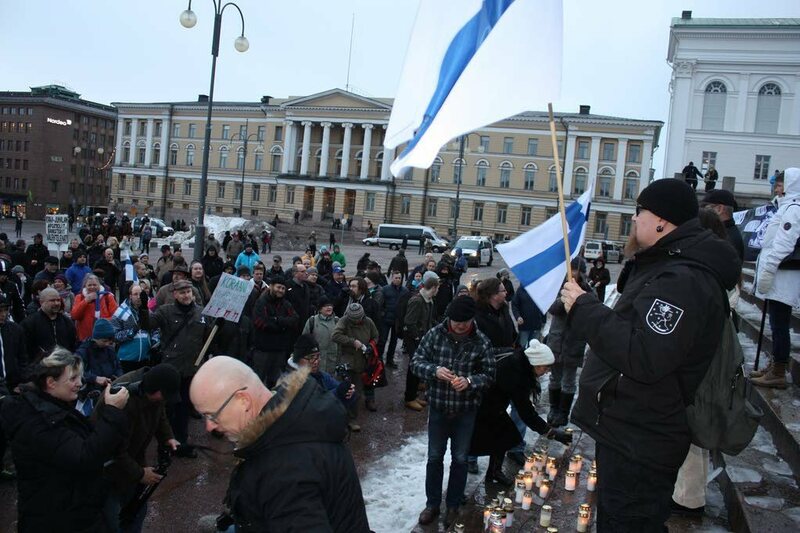 In Turku, we pestered the city council so much with our constant demonstrations that a concilman said that these are no longer demonstrations, these are harassment. Some genius also went full retard and used the slogan ”Close the Borders – Open the ovens”, which is innovative, yet totally over the board – but we can laugh at it now! In Tapanila, we pestered the local karate club for giving classes to the invaders. Again, these demonstrations were constant from week to week and really attacked the sanity of the local do-gooders and social justice warriors. The loudspeakers, alone, got to them! In the telly, we had two of our founders who beautifully argued for RKK and Soldiers of Odin, making the point that we are defending the dream (a reference to the do-gooders dream of a multicultural hellhole) of Minna Canth who dreamt of women being able to walk the streets of Finland and be safe. This made the do-gooders furious, again, and they wrote newspaper pieces crying about that Minna would have never went along with these racists who should have never been allowed in the telly in the first place. We used the shirts of the Finnish hockey team and got their official to complain about us wearing their shirts. We had the same lulz for wearing Finnish state lion symbol necklaces that are now apparently racist because we touched them, as well as the Finnish flag. LOL. And one person succeeded in getting into trouble for threatening the church for supporting the migrant invasion. A bit later another person did as well. 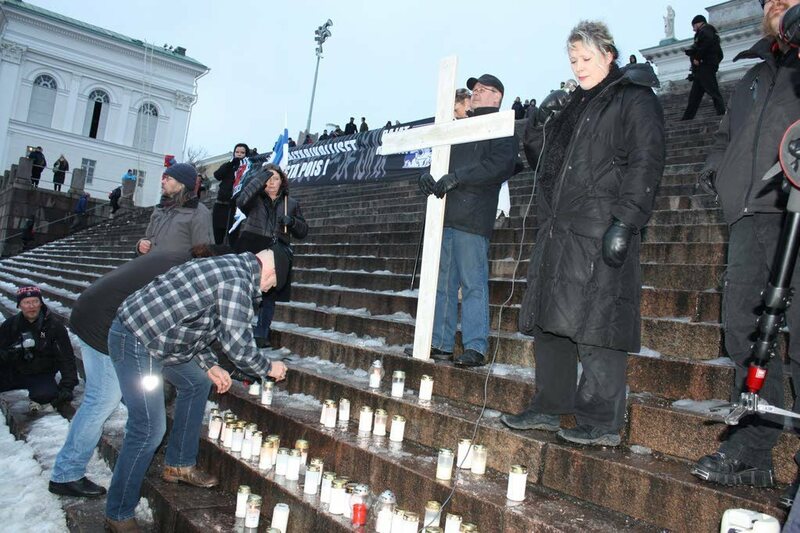 And we had a demo w/a huge cross to remember those fallen for the dream of multiculturalism which ended on the church steps. The church protested. We threatened them with a law suit for calling us racist. Eventually, we didn’t, but it was good fun. Maybe next time we will. Luckily the other threats were empty and no churches were burnt apart from one that was of course blamed on us even though it was unrelated. We motivated, for our part, the spawning of several street patrols, which are, in fact, still about (as opposed to what the media tells you) and one of them is Soldiers of Odin, not small feat, that one! Soldiers of Odin is now world wide! Again, we told the politicians, the bureaucrats and media dozens of times how stupid, incompetent and useless they are. That was like a breath of fresh air in this land where we’re constantly being lied to and treated like idiots. 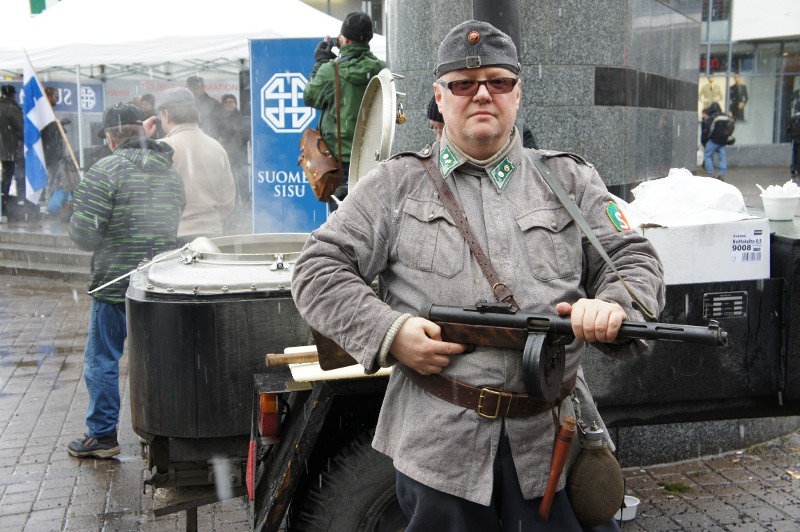 We also had one guy to show up to a demo in a WW2 soldier’s costume w/a Suomi machine pistol from the era and a knife. The press chocked on their banana. We also made a meme and posted it onto a left-wing politician’s Facebook wall that had a picture of an ISIS fighter holding a beheaded head and had this politician’s face copied onto it. She went berserk and complained to the police. Nothing came of it, but lulz. And, of course, last but not least, we demonstrated against the demo that had the crème de la crème of Finnish politicians along with the leftist traitors demonstrating against ”nationalist violence” (there wasn’t any, really, an accident at best) – Well, we succeeded in causing enough noise to be a black cloud on their great day in the sun! This – and many other things – we did in our first year – and now looking back to it I have to tell you it’s been EPIC. I want to thank everyone and all who took part in one form or another in our first year of resistance. Your work has paid off and is paying off – the policies are becoming less invader friendly – so we have already affected change! Thank you, all, let’s make this year as epic as the last one and let us be the pain in the behinds of the ruling classes for years to come! Close the Borders!! Finland for Finns!!! We’ve been outrageous, we’ve been terrible, we’ve been a real pain in the elites’ behinds – and it has been not only epic, but also a thing of real beauty, of bravery – and persistence! Thank you all, again! – The RKK founders. Edellinen artikkeliEntinen poliisijohtaja varoittaa Suomeen jäävien käännytettyjen ryhtyvän rikollisiksi. 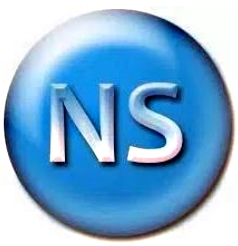 Seuraava artikkeliNaiset entistä enemmän mukana jihadissa.